Former first lady Rosalynn was a caregiver herself and she believed that family caregiving is a cycle of life that touches everyone. Here, four people, each at a different point on the cycle, share their care stories from the heart, offering words of wisdom and points of caution. As you read, consider your journey on the Cycle of Caregiving. Where are you? Are you prepared? I worked as an elementary school teacher for 33 years and recently retired from the Hawai‘i State Department of Education. My husband, Gerald, is still working at Pearl Harbor Environmental Division and plans to retire in a year or two. We have been happily married for 35 years, are empty nesters and have three successful children, Chase, Shelby and Dayne. We love to travel and enjoy new experiences. I planned to have an active retirement volunteering, traveling and, especially, enjoying my favorite hobbies — Zumba and yoga. A year ago, right after I retired, Dr. Edith Pang called us to report that Pearl “Popo” Lee, Gerald’s mom, was in feeble health. She notified Gerald to say, “Your mom needs someone to care for her, and your mom picked you.” It took us by surprise! Popo was a stay-at-home mother who became a widow seven years ago, and was suffering from diabetes, gout and other physical problems. She has four children: one in San Francisco, one in Japan and two on O‘ahu, Gerald and his sister. We were shocked and unprepared but felt a sense of obligation to help because I was retired, and the other siblings were not able to take her in. Popo sold her home in Hawai‘i Kai and moved in with us a year ago. Being responsible for an elder’s health and well-being can be overwhelming. Providing meals on a diabetic and gout diet plan, monitoring her exercise, physical therapy, medications and scheduling her doctor’s appointments and social activities are one aspect; preparing our home — installing grab bars, door handles, nightlights and converting a bath to a shower — is another. Adjusting our lives and schedule so that she retains her dignity, feels contented and stays healthy is a challenge. I am happy to say that Popo’s health has improved since she came to live with us. She did not eat a healthy diet and wasn’t getting enough exercise on her own. Now she has lost weight, increased mobility and her stamina for exercise. Her balance has improved and her sugar levels are good. I think the structure of a daily routine makes her more confident. 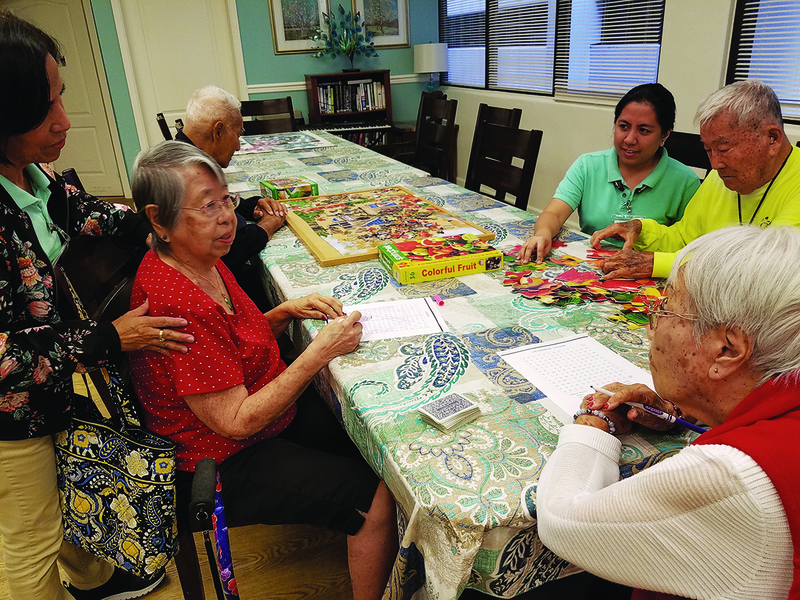 Popo enjoys activities with her new friends at Hale Hau’oli in Aiea. Is Popo still able to socialize now that she lives in your home? Certainly. She is enrolled in senior day care at Hale Hau‘oli in ‘Aiea. Kathy Wyatt and her staff provide an inclusive “club” that Popo loves, and she has made many new friends. Our family comes to our house to visit her and are learning that Popo and we need to know when they are arriving. They didn’t realize that Popo is not capable of scheduling or attending family functions on her own. When they take Popo out for lunch, they need to arrange it with us, so we may schedule accordingly. 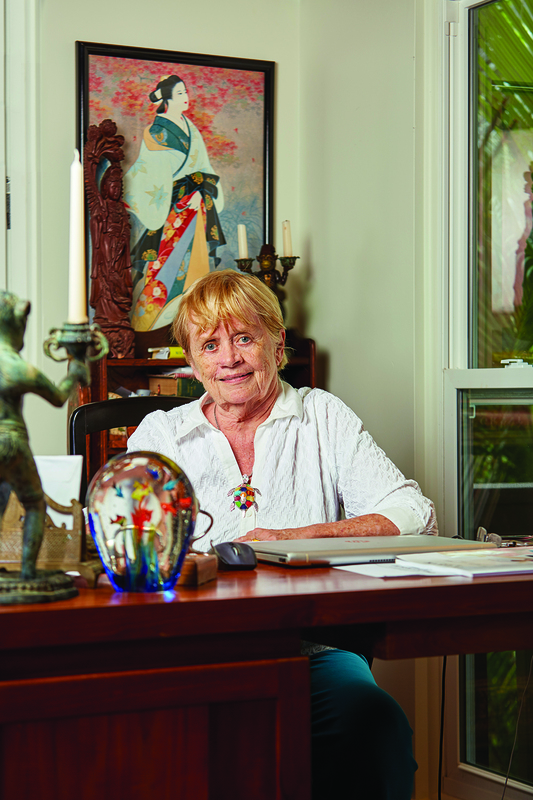 These little adjustments are expected when an elder has lived decades in her own home, but it takes energy to set new rules without offending people who assume she is in the same condition as years past. Where did you find information to train yourself for caregiving? Actually, my mom trained me by example when she was taking care of her aging parents. I am very fortunate to have had that experience, and I am not afraid of this vital responsibility. To find local resources for Popo, we look online and get advice from neighbors and friends who are caring for their parents. The resources and advertisers in Generations Magazine offer useful information. Every situation is unique, so we are always thinking and trying out new strategies. Caregiving is a work in progress at all times. That is what takes so much energy. We have barely discussed the future, but if her needs become more than we can handle, we will need to seek professional help such as specialized nursing care. Any lessons learned that you want to share? account. She knows not to give out her credit card number, but somehow she got on Amazon, where purchases are automatically charged to my card! She doesn’t even know what “Baywatch” is! You just have to laugh. Being mindful of each other is very important, too. It’s a marathon, not a sprint, and every bit of help counts. Establishing new habits requires conscious patience, such as reminding her to wear fresh clothes every day. Once the routine is working, focus on creating meaningful memories throughout each month. Anticipation of fun events and seeing family and friends brighten every day leading up to the activity too. Your retirement plans might not include some form of caregiving now, but that might be in your future. Don’t get blindsided. I have a master’s degree in Nursing Education and I love teaching, and for 45 years I have enjoyed being a nurse. Strange, but caregiving is a bit different from nursing. It’s 24-hour duty that never ends and most of the time you are making decisions alone. Having nursing skills and medical background is a significant advantage, but managing and providing long-term care is harder. About eight years ago I experienced unusual fatigue. My thinking at the time was that I was “helping” my husband with chores, finances, driving, and medication management but he was doing his own personal care, so it wasn’t caregiving. One of my closest friends had to inform me that I was really a caregiver! I had eased into it without even knowing. How is your caregiving journey going? I care for my husband at home, and still enjoy being with my tall, handsome physician. The biggest challenge is doing all the thinking for another adult. He looks the same except for a bit slouched in posture and shuffling steps. But he has difficulty making choices and decisions and problem-solving, and it breaks my heart. His short-term memory loss is at times hard to deal with and causes me to ask God for more patience — almost on an hourly basis. However, he can still make correct diagnoses when watching medical shows on TV. The brain is a wonder that continues to baffle me. 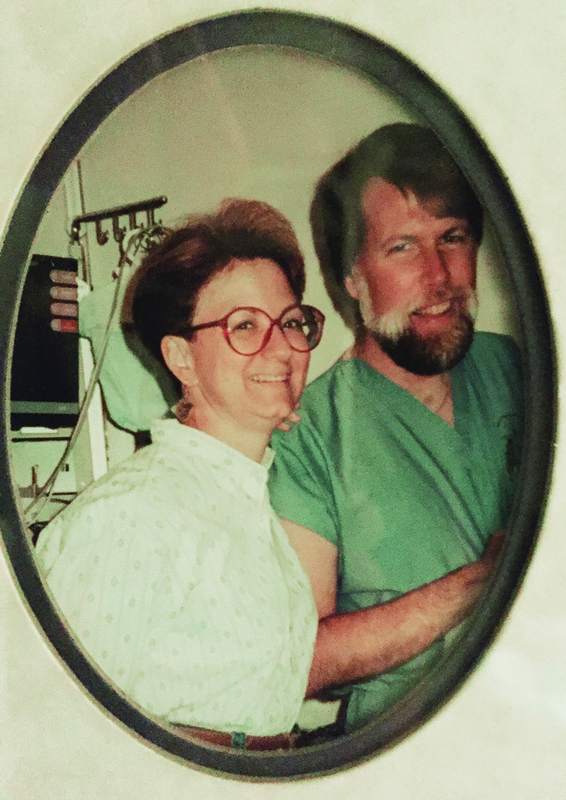 My husband and I worked together, so I was one of the first to know when he was diagnosed with Parkinson’s disease before age 40. He was young, handsome, brilliant, with lots of energy — a fun person to do fun things with. I was very optimistic about his prognosis, and saddened at the same time. He was an amazing doctor. We married, and he continued to work for 13 more years. We adopted a baby together to add to our blended family to make four daughters. Did you have any earlier caregiving experience? I also assist with the care of my mother on the East Coast. After my dad died in 2002, my mom fell into a funk. Previously assertive, energetic and self-assured, she became lost and didn’t know what to do with herself. My family relied on me to help with medical decisions and had I known the symptoms of dementia 15 years ago, I would have done many things differently for my mom. Her father had Alzheimer’s disease too. A sister-in-law and nieces picked up Mom’s wash weekly and drove her to outside appointments before she went into skilled care. Now, the great-grand kids visit Mom and share her activities, like coloring. My brothers have moved Mom’s belongings several times as she graduated to more intense levels of care. They set up her room the way she likes it. When they visit her, they “face time” with me so I can actually see how Mom looks. I have been the financial contributor as well as her health care proxy. My retirement savings ran out in 2016 and, last year, all her funds were gone and I had to apply for Medicaid for Mom. I am grateful that we have options, but it is very sobering to see your loved one outlive their financial resources. Pat, what would you have done differently? My biggest takeaway of caregiving is that I was not prepared. Yes, I had end-of-life discussions with my parents and my husband. But what about the time before the end of life? Both my parents and husband wish to be body donors. That is wonderful, but what about the years of “dependent living” required between now and your ending? I have learned that the journey can be long. I wish I had stayed employed longer. I miss having an income. For intellectual stimulation, I volunteer, go to yoga twice a week, belong to a sewing group and an art group. I would have gone bonkers long ago if it weren’t for my core group of girlfriends, “The YaYa’s.” They are the best support in the world, not only for me but also for my husband. My joy in life is our granddaughters, who bring unconditional love into our lives and home. 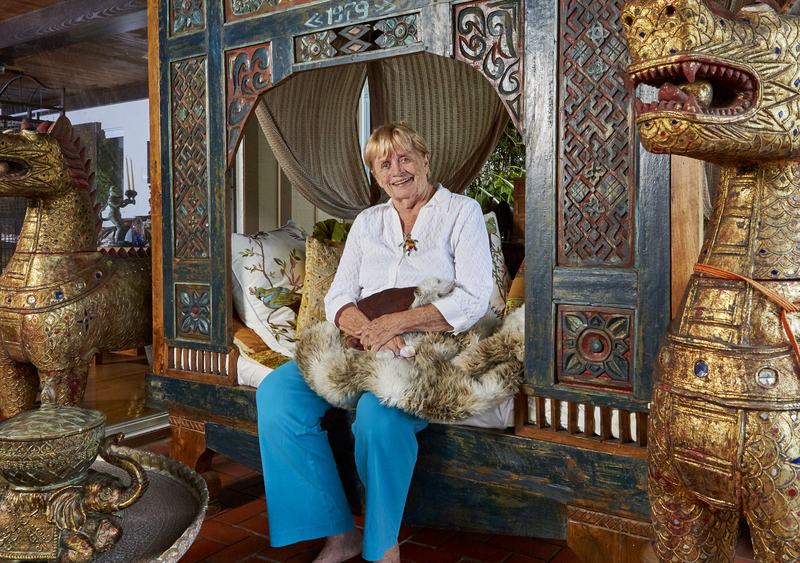 While caring for her husband at home, Pat is also part of her mother’s care team along with her brothers. She regrets misinterpreting her mother’s early signs of dementia. Any words of wisdom for caregivers? My biggest concern is who will pay attention to me should I inherit Alzheimer’s. Who will know the difference between my rational and “not normal” behavior? Therefore, my No. 1 job is to take care of myself. If I do that well, then I can carry out my caregiving responsibilities well too. At the end of the day, I believe that I am doing the best I can for those I love and they truly do appreciate it. I suggest that all caregivers plan for their own future care. Get information from professionals and seek out resources. Last year, I visited almost all the assisted living facilities in Honolulu to see what they offered and if I would be comfortable there. I am proud that I tackled this eye-opening experience. I want to know what will be available for me and not wait for a crisis to figure out where I will live who will care for me. All I am learning will help me make good decisions. I also suggest getting involved with AARP. They opened my mind to a whole host of ideas, options and information. I am grateful to be a member. I am the daughter of John and Maria Mishan. Without my parents, I wouldn’t be here, so I wish to honor that. Every caregiving journey is unique. Mine deepened the love my father and I shared, shaped my character. Tell us when that journey began and about your experience of caring for your father. I cared for my father after he was diagnosed with Alzheimer’s disease from 1999 until his death in late 2006. My father was not defined by dementia, but by a lifetime commitment to family and career. Dad served as a Navy aviator in World War II in the Mediterranean Circle, flying reconnaissance missions on the coast of Africa. He received the Distinguished Flying Cross for his service. Caring for my father was the best and most important thing I will ever do in my life. I witnessed the true hero that he was, remaining a gentleman and expressing love and grace until the end. Caregiving was a gift and a blessing that changed my life. Discovering the lack of resources available, I started to advocate for improvements in caregiver support. During this time I served as public awareness coordinator for Kōkua Mau: Hawai‘i Hospice & Palliative Care Organization. They truly understood my caregiving journey. Assisting a vulnerable loved one strengthens your compassion, courage, strength, commitment, loyalty and patience. Caregivers of family members with dementia ride a roller coaster of anger, depression, stress and exhaustion; I learned that compassion is stronger than negative emotions, and patience is a muscle that can be strengthened. Like characters in “The Wizard of Oz,” we don’t know our courage until tested. Our brains and hearts will rise to the occasion. 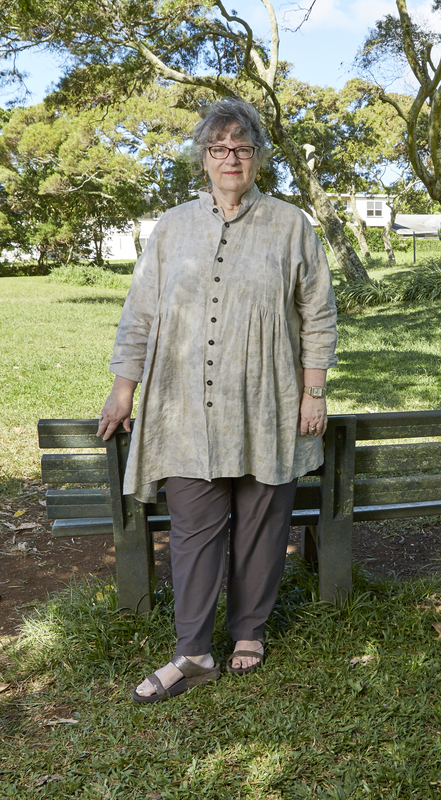 Jody’s father, a Navy aviator in WWII, loved being out in the fresh air, so she incorporated walks in Manoa’s beautiful neighborhood parks into his care routine early on. Can you share some details of your caregiving? 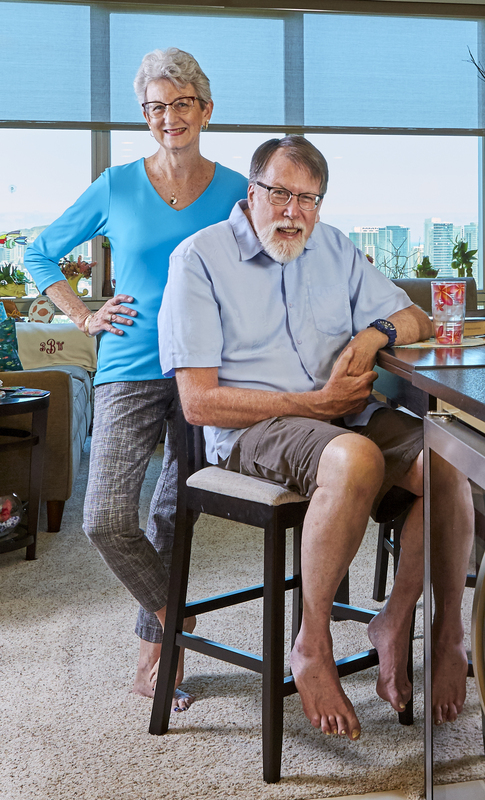 Early on, Dad was diagnosed with a mix of Alzheimer’s disease and Lewy body dementia, which explained the stiffness he experienced as it progressed. We made the best of the gradual loss of physical and mental ability, developed a good sense of humor, learning to “not sweat the small stuff.” We validated him, made him feel loved and treasured, giving him “moments of joy”— important pillars of dementia care. 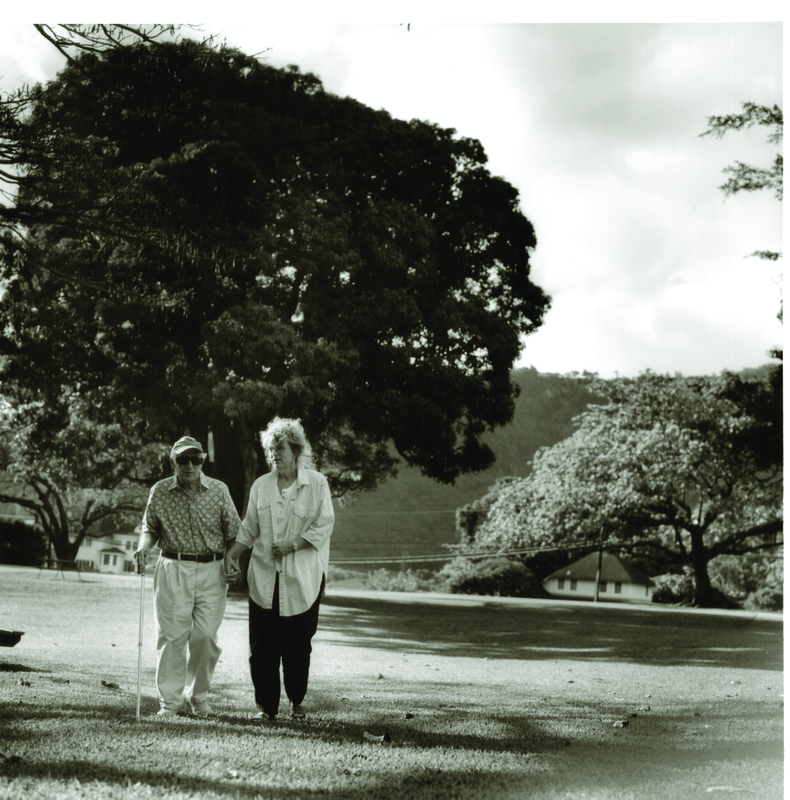 In those early stages, Dad enjoyed going places in the car and taking walks in Mānoa where we lived. For the last three years, he was unable to move on his own, in need of total physical care. We were able to afford professional caregivers in the daytime, but I was alone with him at night, setting my alarm to get up to turn him in bed and change him if needed. Sometimes I had day shifts too. Do you have any tips for new caregivers? I noted things that worked or did not work on my dementia caregiver’s journey. Seek resources, help, support, anywhere you can get it. It takes patience and time to identify people and services that actually make a difference. Be proactive: read books, search online. Join a support group and seek dementia caregiver training. meditation, visualization or exercise. Find anything that brings you joy, even if it’s just 15 minutes with a friend or walking. If your loved one has memory loss, see a geriatrician or neurologist for an assessment. About 9 percent of conditions causing memory loss can be reversed. An early, accurate diagnosis is essential. If they are able, take your loved one for walks or shopping to help them remain a part of the community as long as possible. How did you deal with caregiver burnout? Praying for strength and guidance became a regular habit. I also bonded with other dementia caregivers at an Alzheimer’s Assoc. support group for poetry and journaling led by Frances Kakugawa. Regularly talking about my feelings with a counselor made a huge difference! I also found compassion, support and understanding from co-workers at Kōkua Mau. The beautiful love that Dad and I shared gave me strength. It made me happy to see him content and smiling, safe and comfortable. There were times I lost my temper, which is normal for dementia caregivers. I found myself cussing in traffic, getting irritated when he was not treated well in hospital or rehab. It surprised me that I could get so outspoken and not care what others think. But I was fighting for him and his rights, so it made me ornery. My lack of sleep did not help. Were there any residual effects? This is a critical question! It takes years to recover from the caregiving burnout, to grieve and process the experience. You have to train yourself not to be vigilant anymore, to sleep through the night, to put yourself first and find joy again. It’s like PTSD in many ways. There should be support groups or counseling for recovering caregivers. Before becoming a caregiver, I was an audiovisual writer/producer. After his passing, I wrote/produced “The Genius of Aging” public awareness campaign for KGMB TV. I was a coordinator for the first State Plan on Alzheimer’s Disease and Related Dementia for the Executive Office on Aging. Now, I am a consultant for UH Center on Aging’s Hawai‘i Alzheimer’s Disease Initiative. So caregiving for Dad set me on a new career path working on dementia projects with fantastic healthcare visionaries, service providers, aging advocates and educators. Dementia caregivers are now my tribe — people who really care. What caregiver resources do you recommend? Explore the Alzheimer’s Association classes and services. Attend Positive Approach® to Dementia Care workshops. Locate a Memory Care Navigator on this UH website:. Poetry and journaling are one of the most essential and effective healing activities I discovered on my journey. Visit Frances Kakugawa’s blog. I was a VP for human resources for high-tech Silicon Valley employees who were making over $100k annually and losing their jobs. In the industry, it is called “out-placement,” a process by which companies assist laid-off employees find new employment. My book, Alternative Ways to Work, helps people manage career change, re-imagine their skills, and stay relevant. Another of my 35 books that seniors love is The Hundred Year Life: juxtapose imagination and facts. I write about what I do best — embrace the future with joy and gusto. To be honest, I have never considered slowing down by choice or by need. But Percy Ihara tells me that 70 percent of people will require some long-term care at the end of life. Yikes! I need to start planning! You’re so active at 80; do you visualize yourself in long-term care? So far, I can take care of myself — always have. Long-term care doesn’t sound like too much fun. But I am going to look into local care facilities and options to see what I might be able to afford. Yes. I was a single parent, and all three of my children have college educations — two own their own businesses. 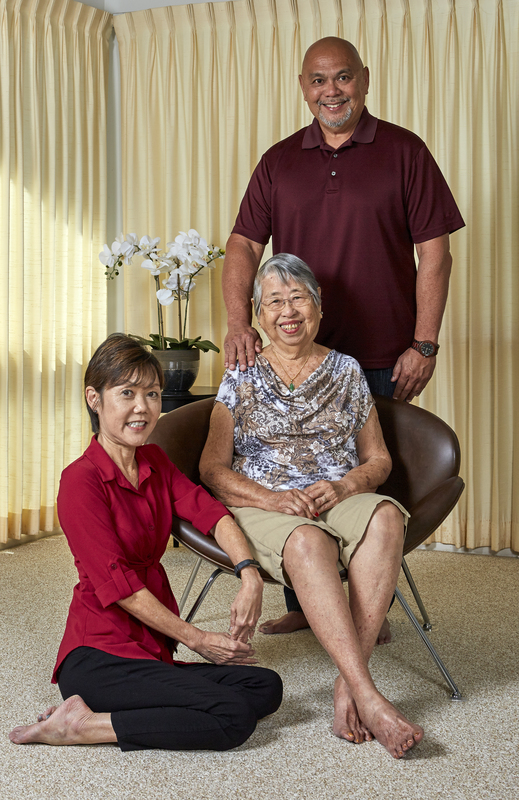 I live in an ‘ohana unit in one son’s home, and when I told him about this interview, he said, “Oh don’t worry. We’ll take care of you.” But my kids have done less planning ahead than I have. I do not expect them to bear the whole burden of my end-of-life care — either financially, emotionally or physically. I read that injuries due to falls often end independent living and break your bones and spirit. I need to call my local Aging and Disability Resource Center and get a free fall prevention assessment of my apartment right away. Can you see yourself in the cycle of caregiving? Time is a big issue. Healthy seniors fear they will outlive savings and retirement income. Yes; I am proud that I lived prudently in my early years and that I still bring in a little income. But I’ll be honest; my vision is to “die in the saddle,” writing books and giving lectures on the road. I want to keep active late in life, but I just learned that people over 70 could expect to outlive their body’s ability to perform the tasks of daily living, and the odds against dying in the saddle are very high. In case I die long, I don’t know if my savings will be adequate. I need a Plan B that addresses other options to pay for the kind of care I want. My children need to know what my wishes are, too. Some of our readers haven’t done much planning either. What’s your next step? Well, I am just getting into Generations Magazine resources, which are chock full of useful information for aging in place and end-of-life planning. I’m going to get educated and educate my family as soon as possible. I just found out that I am too old to buy long-term care insurance, so I already missed out on one financial option. I also learned that Medicare does not have long-term care benefits, so paying for care is my primary concern. I think your readers should share this article with all their neighbors, family and friends who plan to work till they drop. Tell them not to wait until 80 to draw up a Plan B. We seniors who work are experts at what we do — and we also have to be experts in planning for long-term care the end of our lives. Better late than never! 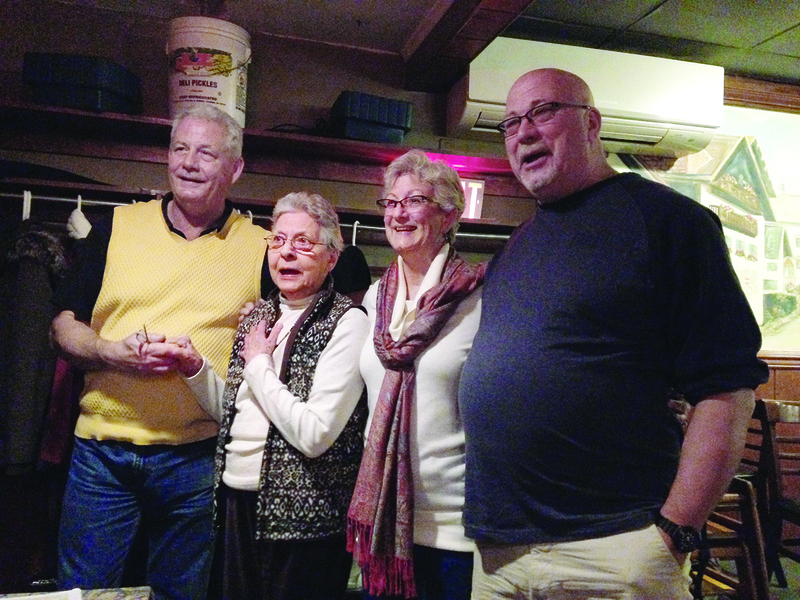 Jody, Pat, Lori and Carleen are at different points on the cycle of caregiving. Where are you? What did you learn from their experiences and tips? Rosalynn Carter and the original members of Last Acts started a significant movement, and they would be surprised to see professionals in geriatrics, long-term care, homecare, financial planning, reverse mortgages, hospice and adult day care and strategies for aging in place struggling to keep up with demand for their services. The number of people over 80, cost of care and waiting lists are all growing. The fact is, family caregivers still provide most eldercare. The common threads in our four caregiving stories are that long-term care is a team effort that requires careful planning. Generations Magazine resources offer many professional options for care. Talking with your family and other families on the cycle of caregiving will help you find the best plan for you.